Many manufacturing facilities have opted to follow the path towards a “5S” workplace organizational and housekeeping methodology as part of continuous improvement or lean manufacturing processes. 5S is a system to reduce time waste and optimize productivity through maintaining an orderly workplace and using visual clues to achieve more consistent operational results where every tool has a designated spot. The tool receptacles are pull-stud specific. 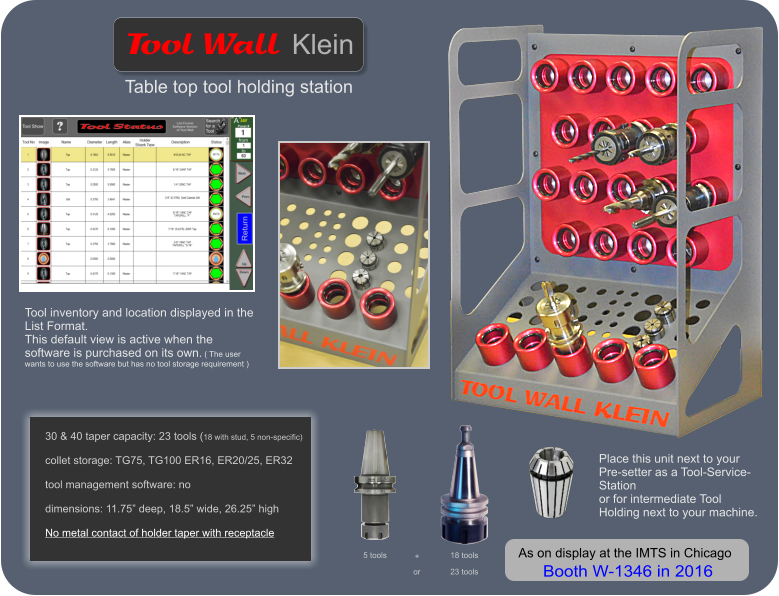 Only tool holders with the same taper and pull-stud can be inserted. 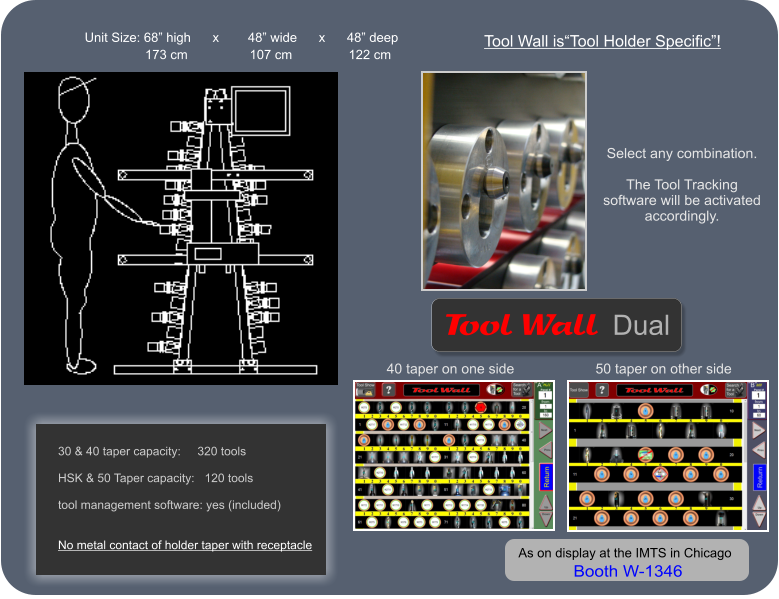 This prevents accidental mix-up of tools with the same taper but different pull-studs. No other system stores so many tools on such a small footprint. • The FAUST- S.A.M. quickset method. This method minimizes the amount of tools you have to place for a new job. Tools that are needed and are already in the machine do not have to be relocated only because the G-Code requires them to be in a different location. 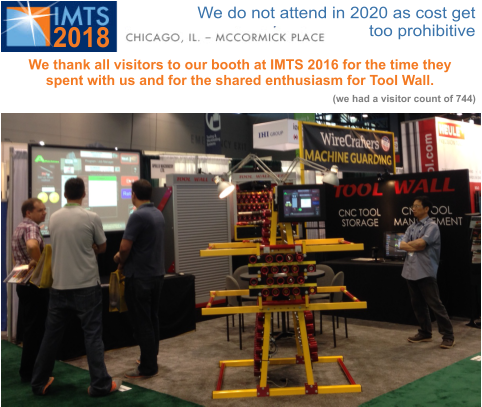 In addition all sub-programs of a job can be set-up at the same time, providing your tool-changer is large enough to do so or select the next job in line for automatic tool retention. 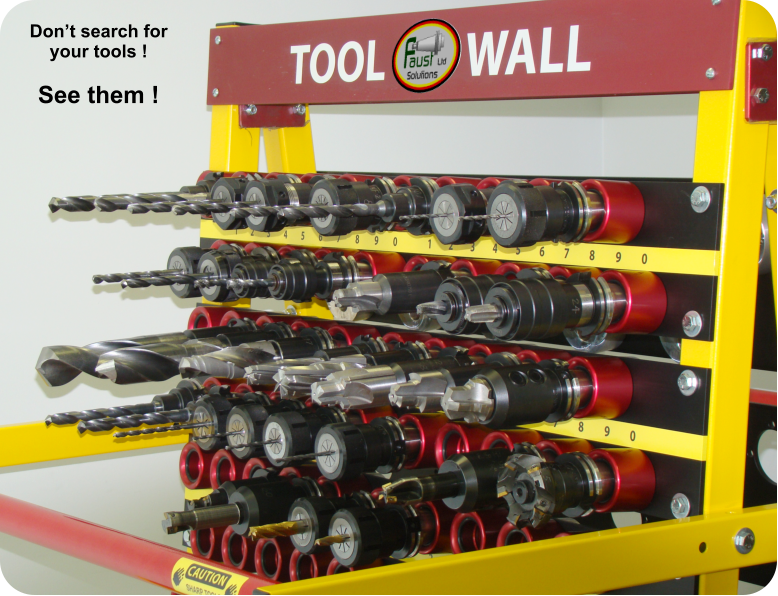 Tools are placed to insure the shortest tool change time. Since this method establishes which tool you need is already in the machine, it re-writes the code to the current tool positions. With this method you never have to keep track of your tools. Just let the system handle it. At first it feels like you lost control but if you produce constantly small quantities, this is the method you want to use. It has however limitations. If your machine has a random access tool changer, oversized tools have to be manually installed with the adjacent pockets being blocked. Only the active program should be on the controller memory. This does not hamper your operation as uploading of active programs is almost instant. In addition to this, you can not run programs that have external sub-routines containing a tool change. 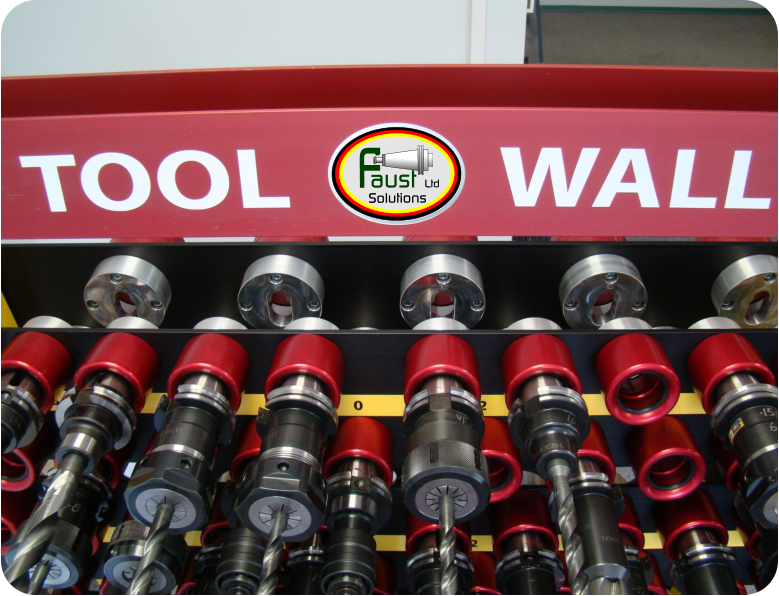 We in our Manifold manufacturing facility use only this method as it is the most time saving and not having to keep track of tools frees up time for other tasks. 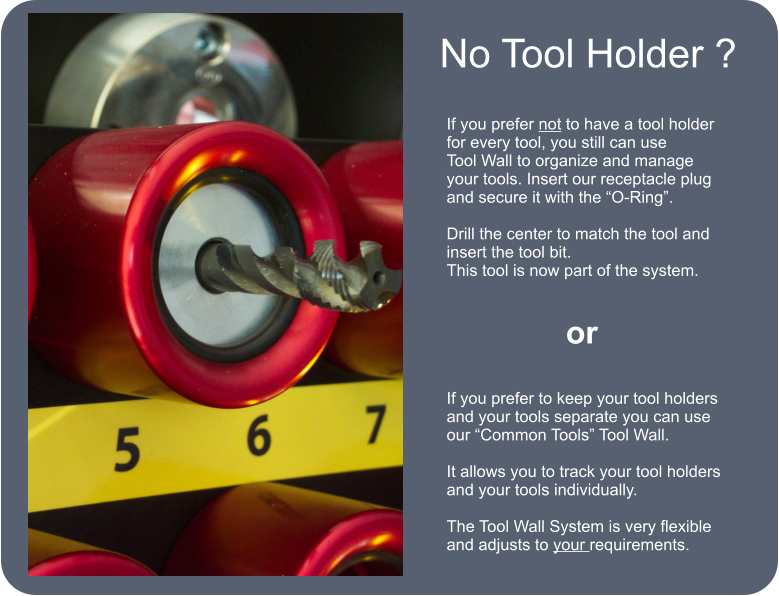 Set-Up in Tool Tracking. 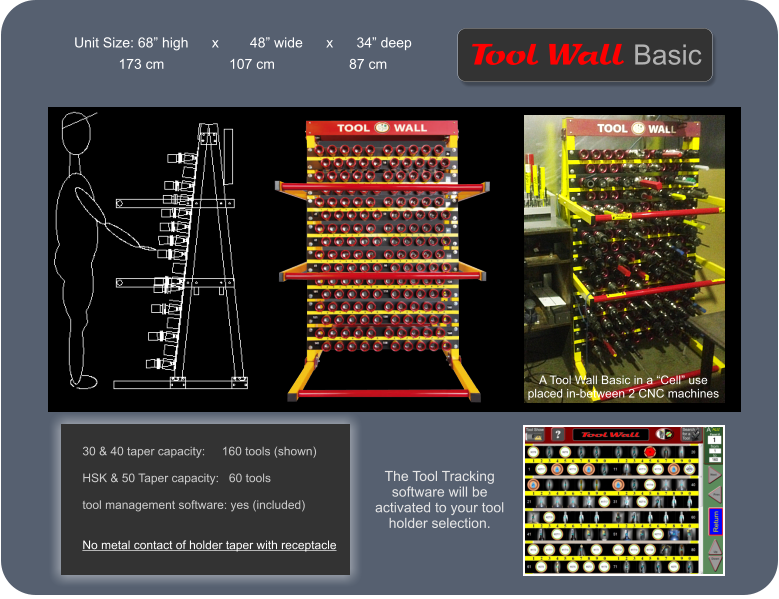 The Tool Tracking set-up is not fully automated. We recommend that you start with Tool Tracking as it gets you going quickly and is always available regardless of preference settings. 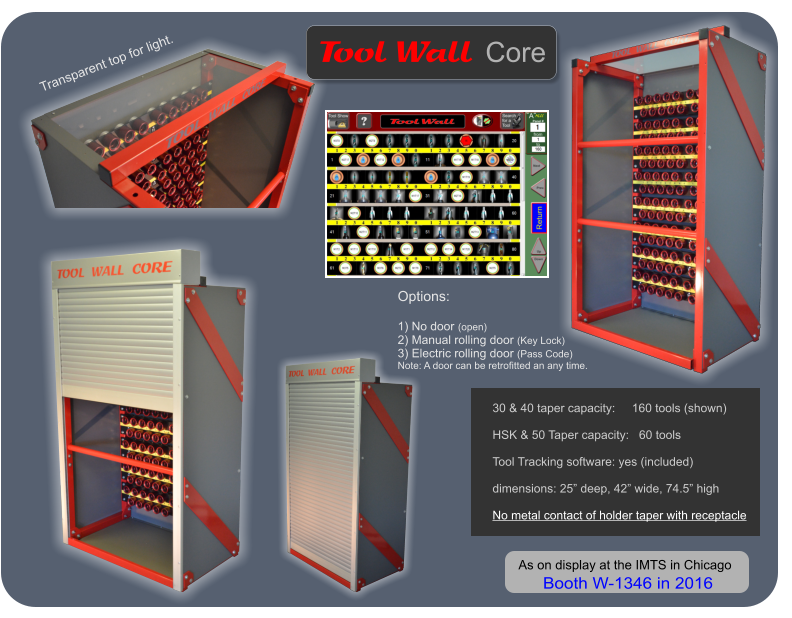 Once you are familiar with all the capabilities of Tool Tracking, explore the other options. This recommended starting version requires the least procedural change of the user and is suitable for all controller types. 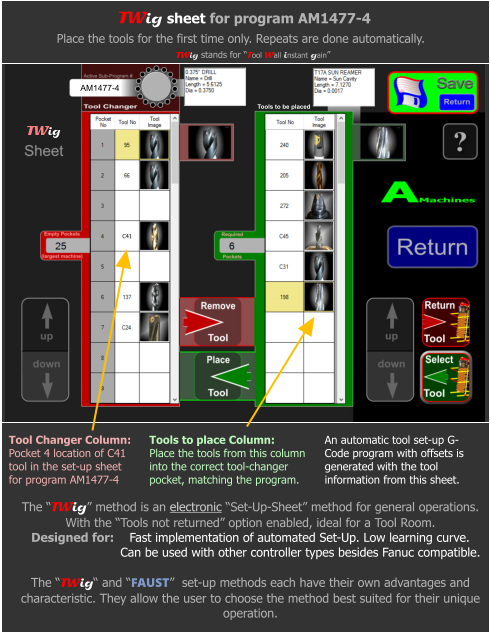 In Tool Tracking a set-up sheet with all relevant installation information and offsets is printed out. Follow the guide and enter the offsets for the job. All data entered into Tool Tracking is maintained and becomes part of required data when upgrading. • The TWig method. 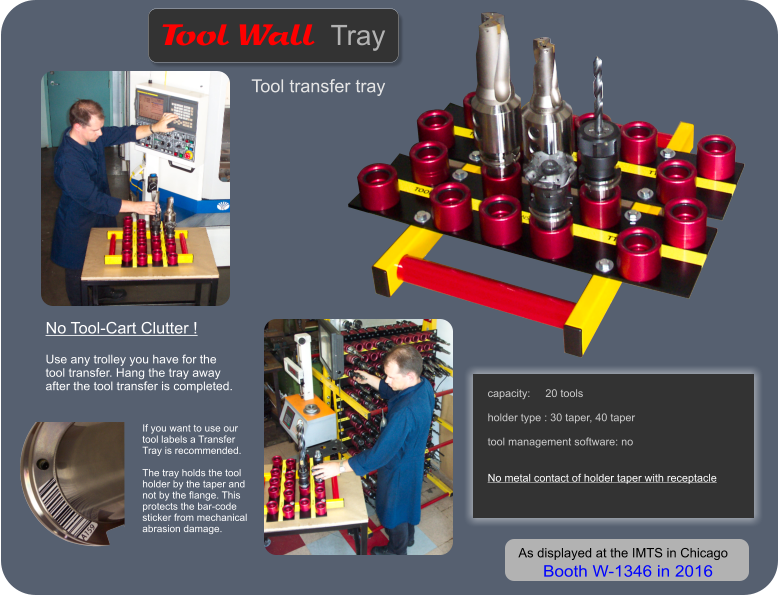 It is the simplest, most intuitive method to reap the benefits of Tool Management. For the implementation all you have to do is to transfer your existing “Paper Set-Up Sheets” into our TWig digital format. Your G-code still uses Pocket Numbers. Just make sure that the H## and D## locations match the pocket number. T## = H## & D##. 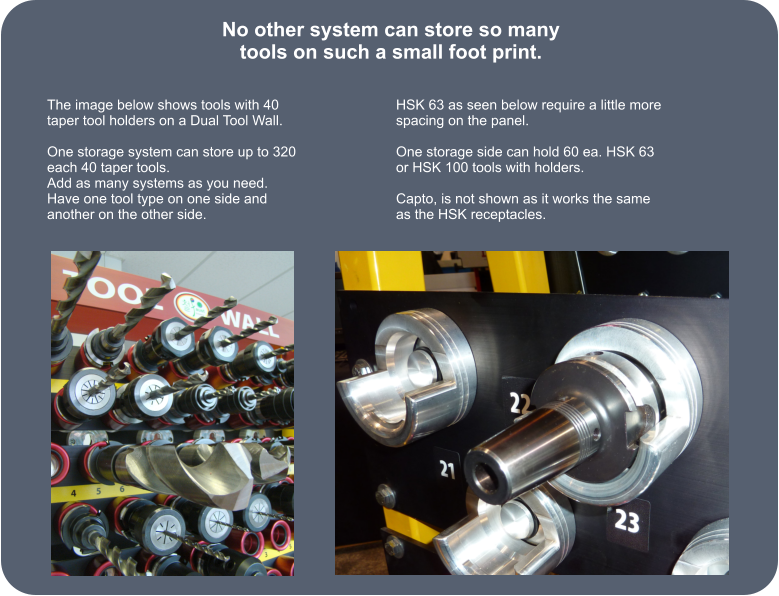 This method can be used throughout but is most suitable for “Tool Room” operations. 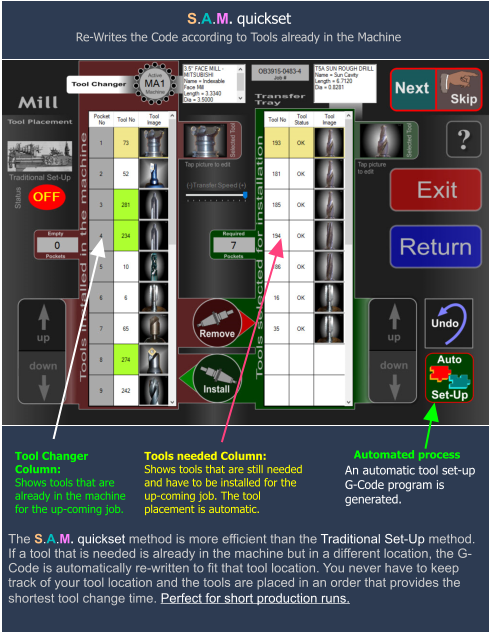 The G- Code can be installed on the machine from any source and can be edited on the machine controller. • The FAUST- Traditional method. It requires that the G-code is written with Tool Wall Numbers. A wizard is provided to aid you in the conversion of your existing programs. 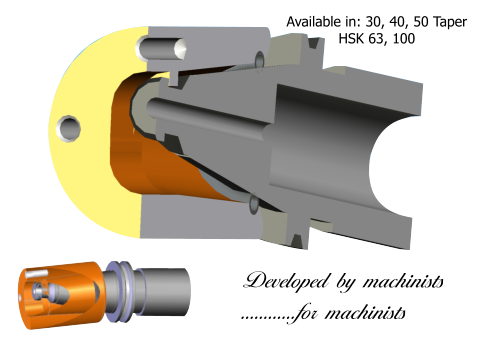 The advantage here is that the programmer selects the tools to be used, releasing the machine operator of it and the current tool profiles can be utilized for simulation. With the adaptation of this method it is possible to alternate between the SAM quickset and the Traditional method. The disadvantage of these methods is that the program can not be altered on the controller without ending up with two versions. 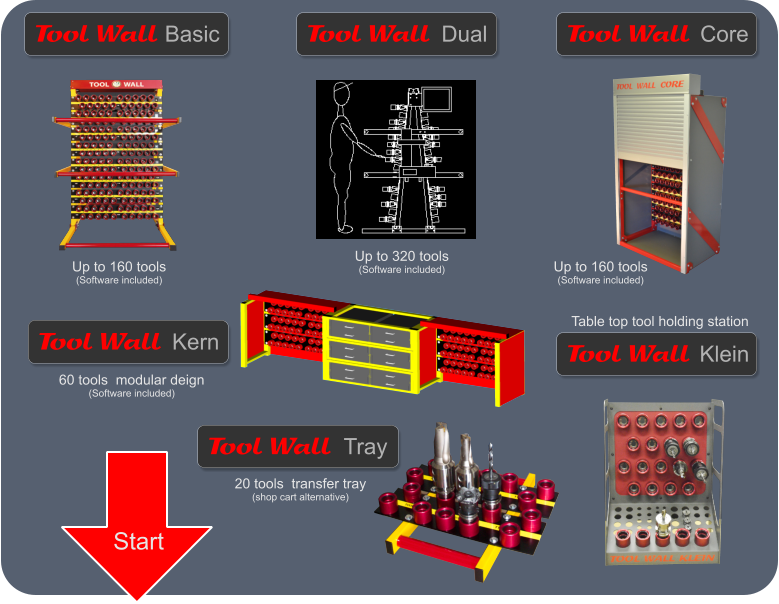 Therefore these methods should only be considered for Cell operations where the Tool Wall computer is close to the CNC machines so that the code can be edited on the Tool Wall computer if needed and resend. If you opted for this format, use the Traditional Set-Up for long production runs were you want to be in control of the tool placement. 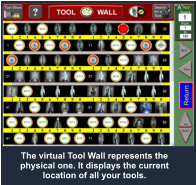 The Job Control module is the heart of the Tool Wall tool management. 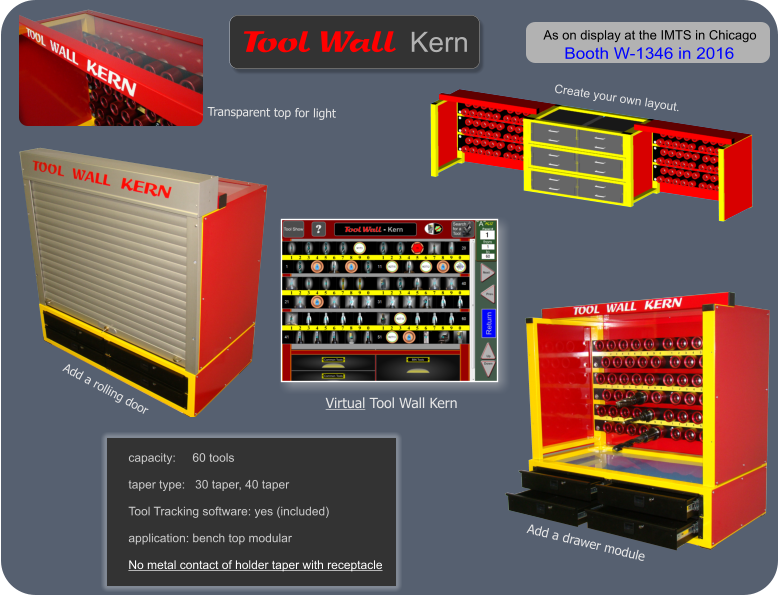 Depending on your preference, 3 different automated tool set-up options can be selected or use our Tool Transfer module for manual tool placement. In all cases an offset tool installation file is generated. Requires your code to be changed from pocket #’s to Tool Wall #’s. TW computer to be located next to machines. The TWig and the FAUST methods can be used simultaneously. Use the FAUST methods only if you are an experienced user as various restrictions apply.